Is Big Data for Healthcare a Probiotic? Danone is a company which deserves much admiration. For thousands of years, the ‘lactobacillus bulgaricus’ cultured milk - as indicated by analysis of this bacteria’s genome - was consumed as yogurt. Let’s not underestimate this historical disruption. Probably due to a chance event somewhere in Central Asia, this bacteria-cultured product extended the useful life of plain milk from less than a day in warm climates to three days or more. Useful, considering the lack of refrigeration at the time. A few decades ago came the incremental innovations of adding Bifidus Actiregularis bacteria to yogurt and packaging it in an organic compound called PLA Igneo instead of polystyrene plastic. Danone promoted this nutritionally advanced and re-packaged product as a ‘probiotic’ with their successful Activia brand, and thus created an annual $4 billion market. Not bad for a commodity product right? Well, labelling yogurt as a probiotic was no hype as per Danone’s commercial success shows. Big Data - Hype or Reality? I recently had the privilege of co-hosting a short talk on Big Data with the Chief Medical Officer of Dell Health and Life Sciences, Dr. Nick van Terheyden, to a group of distinguished guests at the NHS Innovation Expo in Manchester, UK. Dr. van Terheyden spoke about the flood of data originating from behavioral, demographic, social and financial domains and underscored the importance of predictive analytics that will not only shape delivery of healthcare but also define the science of prevention in the next decade. If you’re on the customer side of the healthcare industry, I would suggest that you have the full right to do a sanity check on whether you’re being hyped by the concept of big data. Is the whole IT industry repackaging plain old yogurt cultured by a mixture of Data Warehousing, Data Mining and Business Intelligence tools under the Big Data label? Well if Activia is any guide, architectures, packaging and delivery methods have changed considerably. Does your data require surgery? You no longer have clusters of computers crammed into a datacenter for high performance computing. Dell’s Active Infrastructure HPC for Life Sciences is comparable in size to a fridge and can sequence up to 13,000 genomes in a year or 37 per day. Delivery methods have also been transformed by cloud-based technologies and as this blog post indicates, you can rent a Dell based SAP Hana appliance over the Amazon Web Services for as low as $3500 per month before you decide to go with an on-site solution. It’s important to reinforce at this point that privacy and security is a major concern for the healthcare industry so careful consideration must be taken when choosing a solution. So big data has arrived. It’s no longer a hype but the main question remains of its probiotic value - is Big Data any good for the healthcare industry? Well, according to this WebMD article, probiotics are good for our health so if we carry the same analogy, we may claim Big Data is also good for the healthcare industry. But let’s hold on to that thought for a second. Sometimes, probiotics come short of curing human ills and you may have to undergo a medical intervention including surgery. 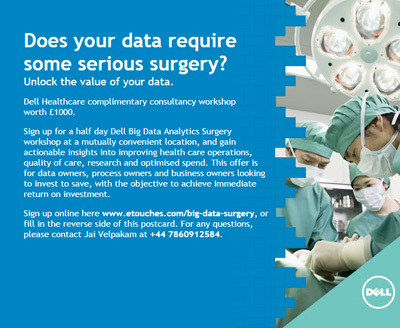 With that in mind, Dell and Intel is promoting a 'Does your data require some serious surgery?' campaign offering all our customers a free assessment on your Big Data needs. Reach out to us by filling out this request form and we will happily be at your service.